I find it awfully interesting that there are headlines today involving both gay marriage (in relation to Chick-Fil-A...who knew a chicken sandwich joint could ruffle so many feathers? 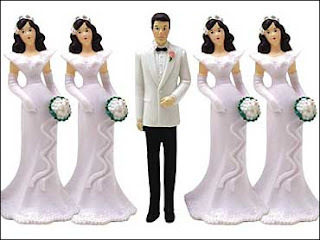 ), as well as plural marriage (or bigamy, or polygamy, or stupidamy). I say that because, I've often compared the two when questioning those who support gay marriage. What I've found is that gay marriage proponents are pretty much just being political and could care less about gay people when it comes down to it. And those who aren't being political are either gay or pro-gay, or think that it's just the "in" thing to be pro gay marriage. On the other hand, there are very few who support those who get into plural marriages, as most people consider them "religious nuts", or, like myself, just regular old "nuts". Few, it seems, share my own views on the matter. On a personal level, I am against the idea of both plural and gay marriage. I believe, as a Christian, that marriage is a sacred bonding of a man and a woman. I also think that the basic family unit involving a man and a woman raising their children has been so beneficial to humanity, that screwing around with it is utter foolishness. However, I am also a big believer in liberty and the ability of each individual to choose how to live their lives, whether I agree with that lifestyle or not. I don't consider it my place to judge others, since I'm not Mr. Perfect myself. But more importantly, I really don't think it is government's business either. At what point did government feel it had a responsibility to define and regulate marriage, or any other life-style choices? As a Christian, I believe those kinds of choices are between a person and God. And from my political viewpoint, I believe those choices are individual choices and not anyone else's. Government doesn't belong in the bedroom. Nor in the kitchen, or the garage, or your backyard. And come to think of it, government shouldn't even leave the capitol. Bad government! Stay! Instead, government ought to stay completely out of people's lives as much as possible. There shouldn't be any such thing as a marriage license. Taking marriage vows used to be all a person had to do. Now, they have to fill out a form. How sick is that? You have to fill out a form to get married. Does that sound ludicrous to anyone else but me? I mean, government shouldn't have anything to do with marriage at all. Period. End of story. Don't get me wrong...I am not advocating gay marriage. Nor am I advocating plural marriages either. What I am advocating is an individual's right to live their own darned lives without government looking over their shoulder. Like I said...moral choices are individual choices and shouldn't be enforced by government. And it doesn't really hurt anyone either. So what if some idiot wants to have two wives? Let him. It'll be his fault when he has to deal with not one, but two "Honey Do" lists every week. He got what he asked for as far as I'm concerned. And if some gay people want to get married...how does that affect me? I don't care about it, I don't even want to know about it. That's their business and none of mine. If they want to live that way, then they have a right to. And I have a right to find it absolutely revolting. Don't ban gay or plural marriages. And don't make them legal either. Or any marriage for that matter. It isn't a legal issue. Government has no right to dictate moral behavior. And if you think it should, be very careful what you wish for. It only seems like a good idea until you're not in the majority anymore, and someone else is pushing their moral laws on you. Just ask women, Jews, and Christians in the Middle East. It's about individual freedom people.